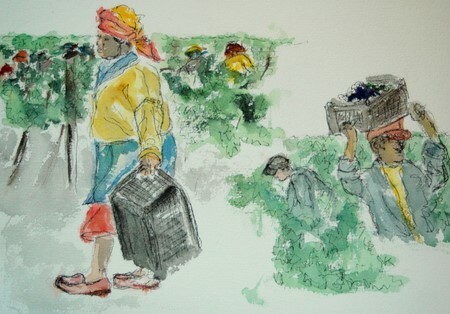 These are my last sketches on the vineyards and grape picking in Stellenbsoch. 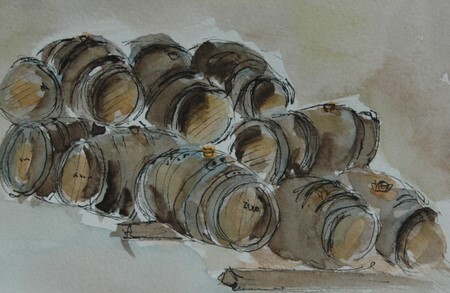 They were done in pen and wash. I plan on using all these sketches to put together a series of paintings…hopefully it will move beyond planning! 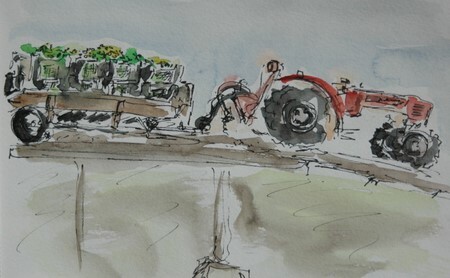 This was much more difficult than sketching the “pickers” when they were taking a break. 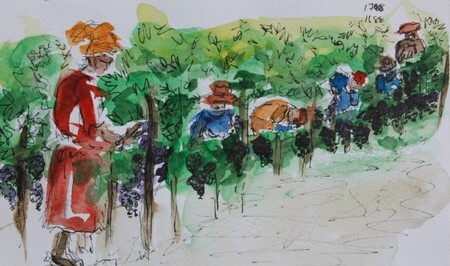 They really picked so fast and their heads were constantly bobbing up and down in the vineyard. Just as I thought I could capture one, he would disappear. In the end I stood further back to only capture glimpses of color in the vineyards. Wow, Ronell, these are incredible. They tell so much – travel journaling at it’s best. I hope there are more to come! These are STUNNING!!! Fresh, VIBRANT! GREAT USE of ink and wash — lovely lovely lovely!! DITTO!! MORE !!! 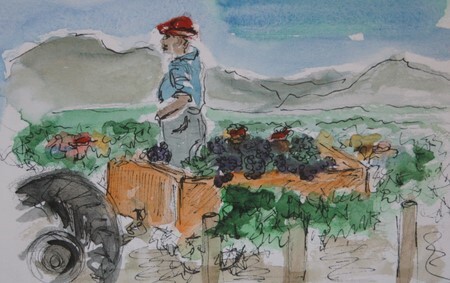 ronell, i can blog-travel to these vineyards thanks to these moments you captured so well with your pen and washes! i really like them. the first one is my favorite. look forward to more! the whole series of them are fabulous! and i hope that you do get around to making paintings from them. Wonderful work! All that’s missing is the glass of wine! You really captured all the steps along the way and your drawings of people are really excellent! I love the colors. Thank you all, for the encouraging comments..
Hi Ronell This looks cool. What can I say except that these are just beautiful! 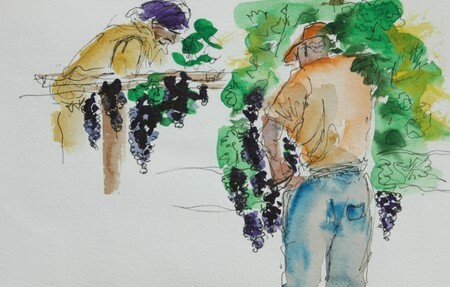 Ronell,I love your loose sketches and colors of the vineyards and that capture moments of time. Wonderful!I want to say thank you for visiting my blog and glad you liked my blind contour. I love drawing them! Thank you everybody for the nice comments, I really appraciate your visiting!